One of the more remarkable stories of recent human history is how quickly the United States of America’s reputation throughout the world changed from being that of a post-World War II savior of the “Free World” to being recognized as a destroyer of other peoples’ democratic hopes and dreams. The secret history of the United States’ recruitment of Nazi Germans and European Fascists, which began as the end of World War II neared is a key to understanding why our national history since 1945 has too often included even the overthrow of other countries’ democratically-elected governments and other peoples’ democratic social movements. With German Nazism and European Fascism no longer the military threat they had been in Europe since the 1930s, United States civilian and military officials concluded that some of the most despicable of villains to be found within the ranks of the Axis Powers could serve a useful purpose in the resumption of the historic U.S. attack upon the Union of Soviet Socialist Republics. On July 6, 1945 the United States Joint Chiefs of Staff approved Project Overcast, which began the importation of at least 1,600 German and Austrian scientists and scientific researchers to our country, with the purpose of aiding the U.S. in military aeronautics and submarine research. Some of these “carefully selected” individuals were members of the German Nazi military network implicated in war crimes. They entered the United States in violation of immigration laws that barred members of fascist groups. And they were allowed to live in the United States despite President Franklin Delano Roosevelt’s rejection of such a plan. But in 1946, new President Harry S Truman authorized the Pentagon’s Joint Intelligence Objectives Agency’s push to use Nazi personnel. According to Christopher Simpson, author of Blowback: America’s Recruitment of Nazis, and Its Effect on the Cold War, Truman insisted that Project Paperclip (its new name) be kept secret from the American public. From that time forward in Europe, another new initiative named Project Greenhouse authorized the United States Army to employ Nazi SS officers and Abwehr agents to provide information to the U.S. about the Soviet Union. 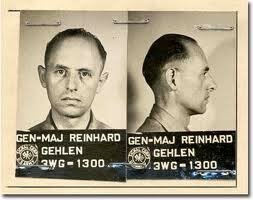 Reinhard Gehlen, commander of Nazi Germany’s Foreign Armies East (Adolph Hitler’s most important intelligence apparatus on Germany’s Eastern Front), was selected to direct an organization of former Nazi and Eastern European Fascist intelligence officers and agents. These operatives became the eyes and ears for United States military intelligence in Eastern Europe. In addition to polluting American intelligence about post-World War II Soviet Union, newly recruited Fascist propagandists also served in such high minded-sounding U.S. efforts as Radio Free Europe and Radio Liberty. The Soviet Union and the rulers of its Iron Curtain nations identified Nazis and Fascists working with Americans inside radio booths in Europe as proof of the United States’ own fascistic proclivities.